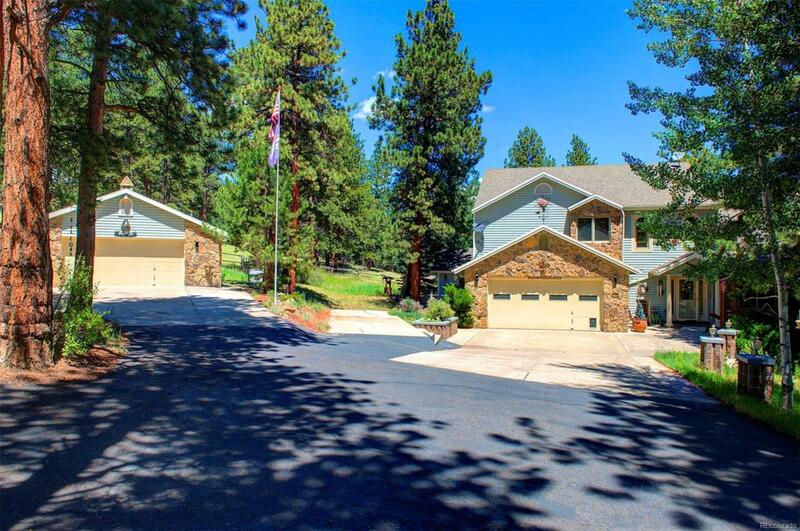 QUALITY built home on 3 gorgeous & useable acres in the desirable Mill Iron D Estates! PRIVATE, TRANQUIL SETTING. This home has it all! Vinyl siding & stone make this a MAINTENANCE FREE home! MAIN FLOOR LIVING, VIEWS, PRIVACY, elbow room, large bedrooms, hobby room, garden room, sun room and more! The main master bedroom has 2 walk-in closets, one as big as a bedroom! New carpet in the living room and stairs leading to lower level. An amazing waterfall feature will delight your senses! There is a dog kennel and an invisible fence for the entire 3 acres! The oversized, attached 2 car garage AND the oversized, detached 2 car garage (could be a large workshop 220volt) provide for ample parking. Paved driveway with landscape lighting and plenty of room for RV and/or boat parking. So bring your toys! Commuting to Denver or the high country for endless entertainment is EASY, as the property is only 1 mile off Hwy 285. COME HOME! Association Name Primary Mill-Iron D Estates Homeowners Association Inc.